VERY cool, VC. THANKS! I look forward to seeing the plane completed. Thanks Al. If I mess this one up, I might be bugging you for some information! I meant, *after* you finish yours, would you be willing to put together an iron and a wedge for *my* plane? I don't know nuttin' 'bout birthin' these babies. Al, I'm going to show how to make the wedge and iron on my blog, so you will be able to replace the parts on your plane. Plus, I hate to do the same thing twice...I'd never make it in a production environment! Plus, plus, it's gratifying to figure things out on your own, so I encourage you to make the pieces yourself. Well, sometimes I feel that way about reproducing things. Even though both my kids were made exactly the same way, they look a little different. Uh, I wonder what I screwed up to make that happen? At least the newer model is performing a little better than the first so I must have improved upon something? I forgot we were talking about woodworking projects. In that arena, sometimes I do like to make a second or more because I get better at it, but it can get boring. VI, you have a good point about improving each time you make the same piece. I have just one question...what do you do with a spill plane? Shazza, a spill plane was used to make long, curled pieces of wood that were used as matchsticks. Thanks for asking! Well...how about that? You learn something new every day! The best is going back to dad. More then sweet. There is nothing, absolutely nothing in life so sweet as being allowed to help your little girl! Problem solved: great! The plane: wonderful. Going to dad - to dad: priceless! God bless, your good deed is infinitely greater then returning the favor. You are right, in fact, my mom called the next day to tell me how much dad liked helping me with my dilemma. It's nice to still let dad be dad. 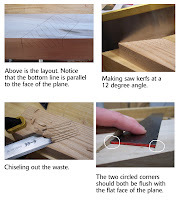 So I surfing looking for articles on how to make planes and I came across something on wkfinetools.com about making a Spill plane. Very cool but what is a spill. Sure enough I Google'd it and came across this post. How cool it that a plane where the shavings are the intended result. Thanks for this post!